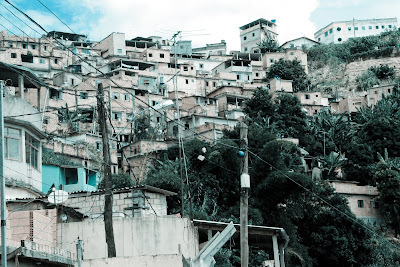 In this post are photos that show the reality of the slum where we live and serve as missionaries - praying, sharing, and sowing seeds of God's LOVE. My good friend Kelly, who serves as a missionary at the Lighthouse Community Center, took these beautiful photos while walking through our slum. 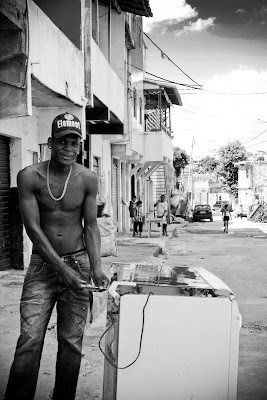 Kelly is an amazing photographer with a deep love for the people who live in this community. She gave me permission to share her photos on my blog - thanks Kelly! There are many many more amazing shots that capture the beauty and the reality of life here... Here I have only posted a few. 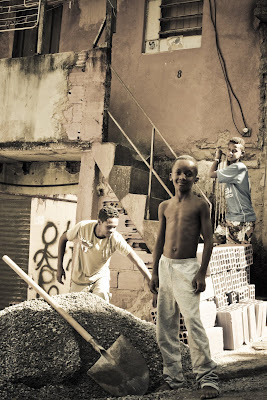 When trying to explain what life is like here, I can tell many stories and paint detailed pictures with my words, but in posting photos on our blog, I feel everyone can really get a better idea of the reality of a slum in Brazil. 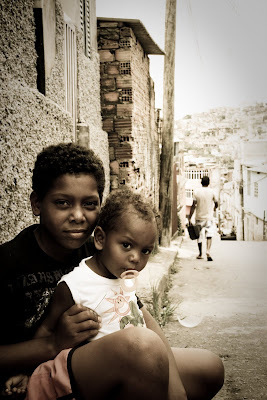 There are thousands of slums in Brazil and a majority of the population either lives in slums or extremely poor areas that look much like this... 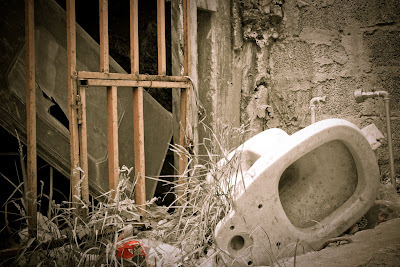 Many people get a better understanding of this reality by seeing photos, or by coming here and seeing with their own two eyes when walking through the slum. 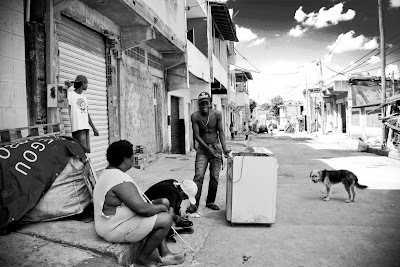 Here is a photo of two missionaries and two volunteers, enjoying their afternoon in the streets of Cafezal slum. One specific ministry that goes out from the Lighthouse feels that God is calling them to pray in this soccer field below. During a time of prayer (on this specific afternoon) this team sensed that they are to pray on a regular basis at this soccer field. 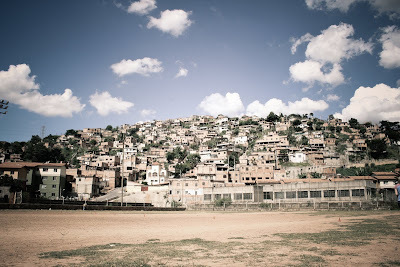 They are to pray for all the people who go regularly to this field to play soccer, watch the games, and also participate in other activities (such as drug dealing, violence, and who knows what else). During a special prayer time on the field the team sensed that God wants to restore the people who go to this soccer field... That He wants to make their lives like a green field, full of life. 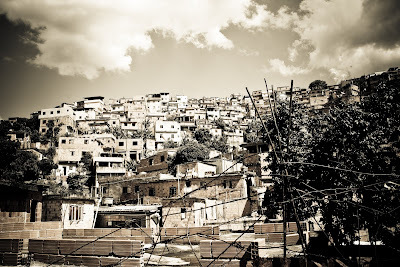 As you can see in the photo below, right now the field is dry and barren, just as many lives in the slum are dry and barren, God desires to GIVE life and bring restoration. Many times you see people in the streets here in the slum. 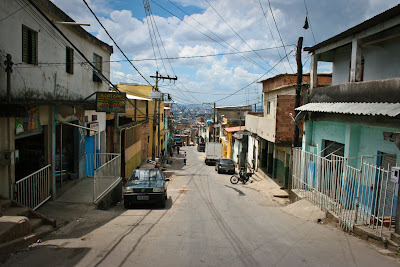 Brazil is a warm climate culture, so people often spend lots of time outside spending time with friends or family. 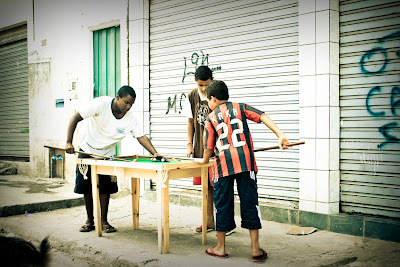 The children are often on the streets playing games like soccer or marbles or even pool - like you see in this photo. This road leads straight to the back entrance of the Lighthouse Community Center. We also encounter many dogs roaming the streets... Sometimes these dogs are in pitiful conditions. 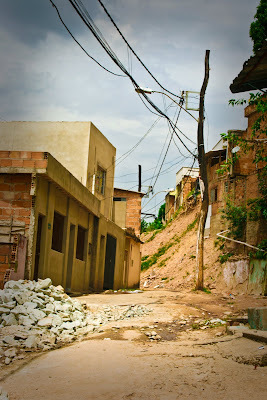 Pray for transformation in the lives of the children and families who live here. Pray for the churches that are established in the community and also the ministries (like ours) who are working to share God's message of hope, love, and abundant life!